"Skilled labor teaches something not to be found in books or colleges." Most Native American peoples look upon the arrowhead as a very powerful amulet. This was especially true in the Yupik peoples of the Koskokwim Delta region of Alaska. In the Yupik tradition it was supposed to produce confidence, generate energy and serve as protection. Our Yupik Projectile Point Arrowhead Amulet is designed after an arrowhead brought back from a delta region shaman by Nelson in the late 1800's. 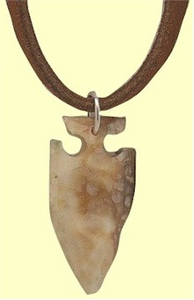 It is a simple amulet carved from Bi-color Fossil Walrus Ivory. The unpolished ivory hangs from a leather thong. An interesting and attractive amulet, powerful and strong. 1 inch high, 1/2 inch wide.